Day 2 saw various textures on display, from a combination of leather and velvet to translucent chiffon. While solid colours were a staple on the red carpet, Katrina Kaif nailed the trend and of course, did us proud! Taking a deserved break from black, the actress glided down the red carpet wearing a yellow Dior gown, styled with Chopard jewels. It fit like perfection, and the train flowed like champagne. Feeling all matched up, the actress wore a raspberry-hued Elie Saab gown which hugged her in all the right places. She topped it off with ruby lips and plum-dyed hair. This beautiful Marchesa tulle gown was made all the more heavenly with billowing sleeves and delicate pastel feathers. Don’t miss the crystal bouquet headpiece. Julianne Moore made velvet look dramatic and effortless, especially as it was draped across the gown’s leather bodice. This rich, bold and burgundy Givenchy concoction was styled with Chopard Jewels. Acing old-Hollywood glamour, the actress wore a timeless black Ralph Lauren lace gown and accented the look with statement Bulgari jewels. 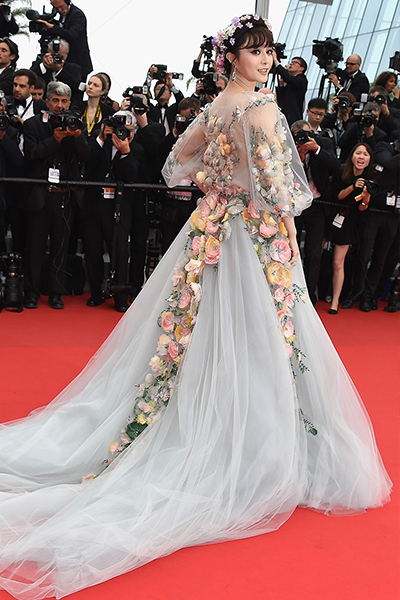 The actress donned a soft and ethereal cloud-like gown from Valentino, putting forth a feminine statement combined with sensuous cutouts.